3) Rustic Potato Bread is powerfully delicious! 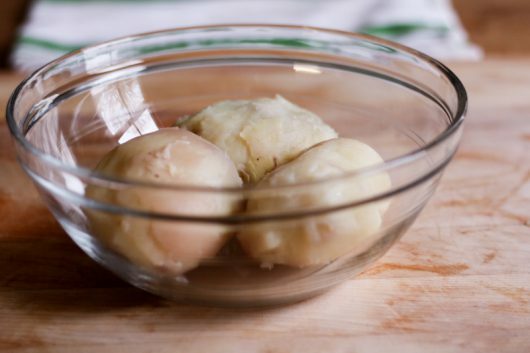 And boil them until perfectly tender — about 45 minutes. 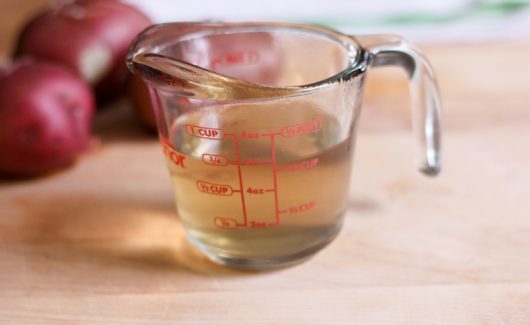 Ladle out 3/4 cup of the potato cooking liquid, and reserve it. When the potatoes are cool enough to handle but still quite warm, peel them. 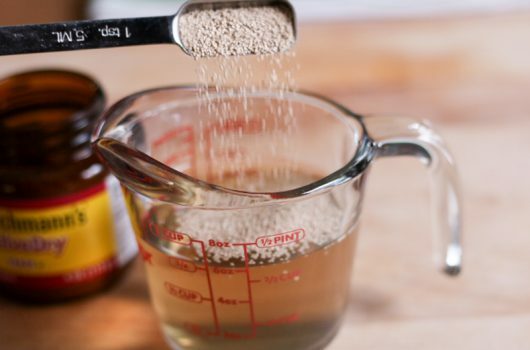 Then whisk 2 1/4 teaspoons of active dry yeast into the warm (100°F – 115°F) potato water. Set aside. I used a stand mixer outfitted with a dough hook to mix and knead this bread. 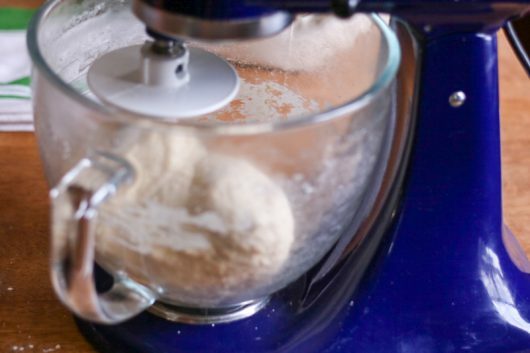 Lacking such a machine, you can certainly mix and knead the bread entirely by hand. 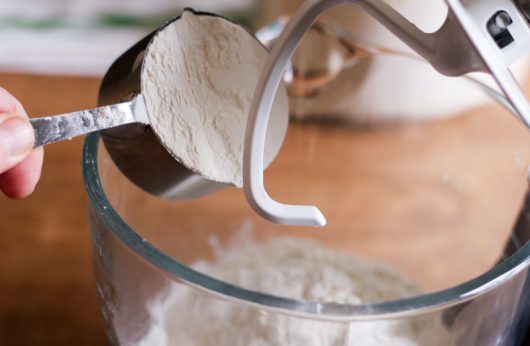 Tip 4 cups all-purpose flour (or, use “bread” flour) into the bowl of the stand mixer. And 2 1/2 teaspoons of kosher salt. Mix at low speed for just a minute. And 2 tablespoons of vegetable oil. You can use olive oil if you wish. I used safflower oil. 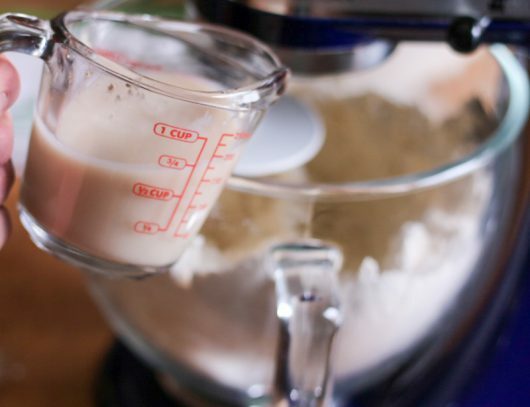 Knead the dough at medium-low speed (#2 on my KitchenAid) until a smooth, elastic dough develops — 5 to 7 minutes. And roughly knead it a few times. And place it in a large greased bowl, flipping the dough to grease the other side. And place it in a warm spot until the dough has doubled in volume — about 90 minutes. My “warm spot” is a drugstore heating pad located beside my Amazon dot and a small but powerful speaker. While the dough is rising, fetch a common colander, and place it on your work surface. And rub it with flour. Line the colander with the floured towel. 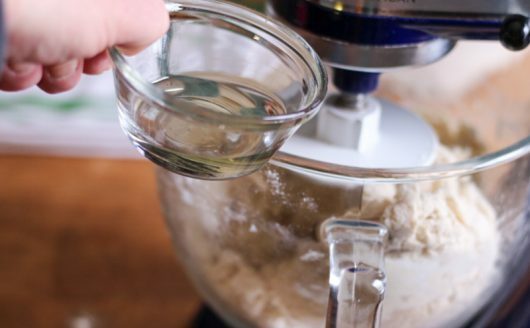 When the dough has doubled in volume, punch it down. Then dump the dough onto a floured surface, and pat it out to remove air bubbles. Then form the dough into a ball, and place the ball seam-side-down in the lined colander. 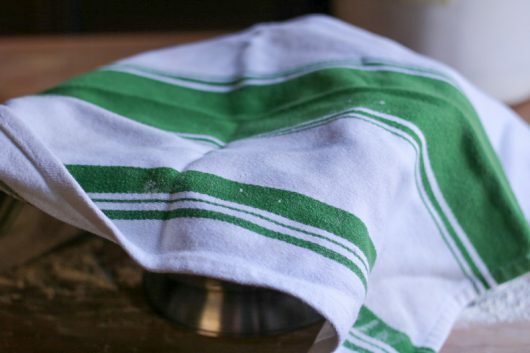 Cover the colander with a green and white towel, and set it in your warm location to rise until doubled in volume — about 1 hour. 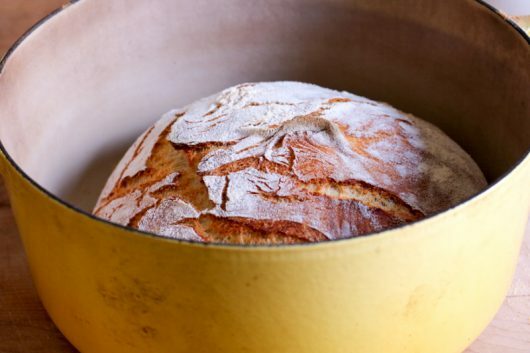 While the boule is rising, grab a heavy pot with a lid (a 5- or 7-quart Dutch oven is ideal), and set it on the center rack of the oven. Heat the oven to 450°F. 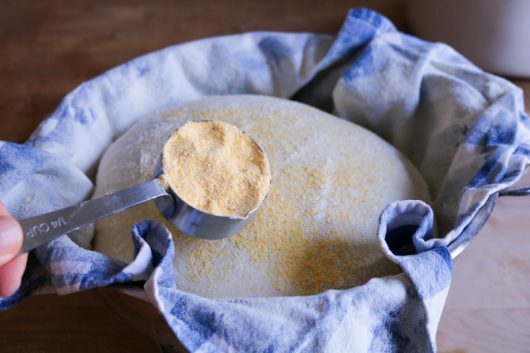 When the dough is ready, sprinkle its top with a little cornmeal or flour (or both). Remove the preheated pot from the oven. Then gently lift the towel, and use it to flip the dough into the pot, the seam-side now facing up. Cover the pot, and return it to the oven for exactly 30 minutes. Then uncover the pot, lower the oven temperature to 400°F, and bake until the crust bronzes and splits at the seams — exactly 15 minutes. 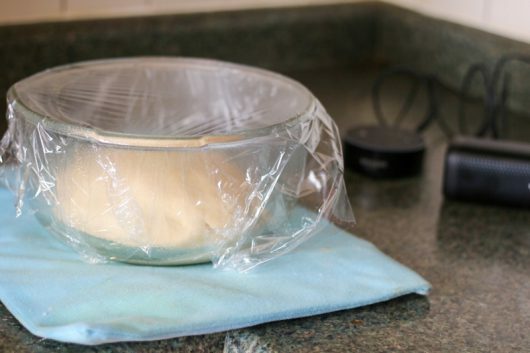 Transfer the bread to a wire rack to cool. In a perfect world, we would wait for the bread to cool completely before slicing into it. This is not a perfect world, baby. Remember, the government is shut down. And people are biting into Tide pods. So let’s eat some potato bread while it’s still warm from the oven! In closing, I’ll simply say that this bread is worth making. Its crust is crackling crisp, and — thanks to the mashed potatoes — its interior is magically moist. Think you’ll give this lovely round loaf a try? You can let me know by posting a comment below. 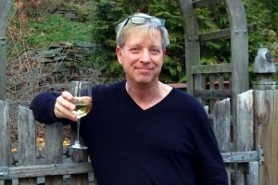 As always, I love hearing from you! 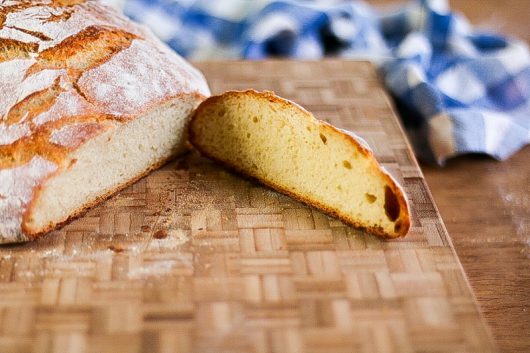 A beautiful bread with a crispy crust and a moist, chewy interior. Delicious for dunking, toasting, or just plain eating! 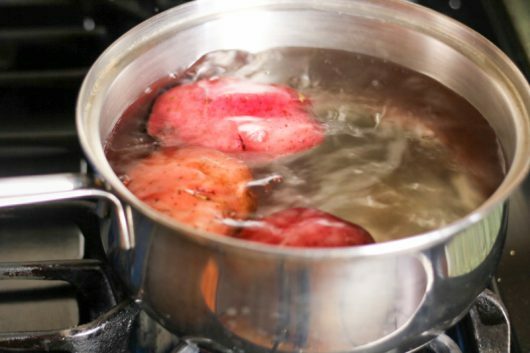 Put the unpeeled potatoes in a pot, add enough water to cover them by 2 inches, and bring to a boil. Reduce the heat, and simmer until the potatoes are perfectly tender -- about 45 minutes. 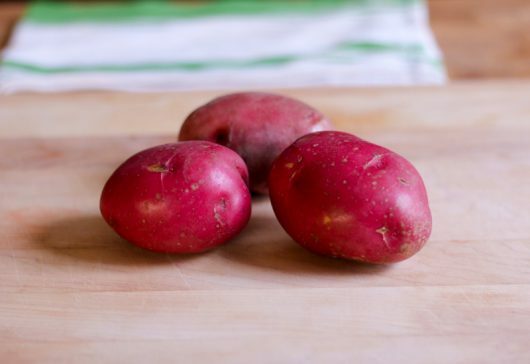 Transfer the potatoes to a cutting board, and reserve, in a bowl or glass measure, 3/4 cup of the cooking liquid. Peel the potatoes when they are cool enough to handle but still quite warm. Put the potatoes in a small bowl, and mash them. 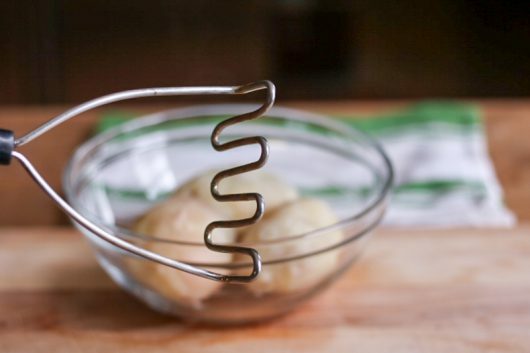 Then sprinkle the yeast into the warm (100°F-115°F) potato cooking liquid, and whisk with a fork to combine. 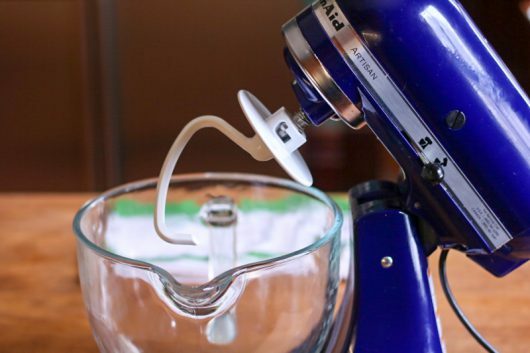 Tip the flour into the bowl of a standing mixer which has been outfitted with a dough hook. 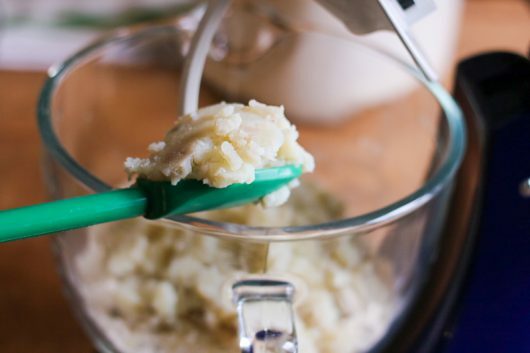 Add the mashed potatoes, and mix at low speed for 1 minute. Then beat in the yeast mixture, salt and vegetable oil. 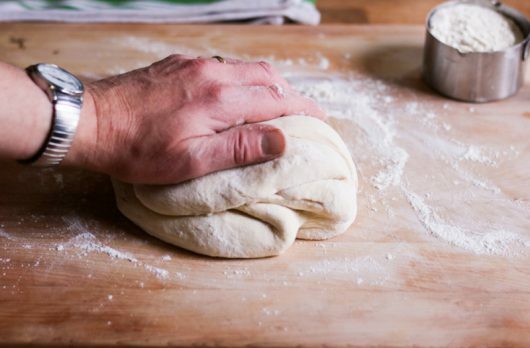 Knead at medium speed until a smooth, elastic dough develops -- 5 to 7 minutes. 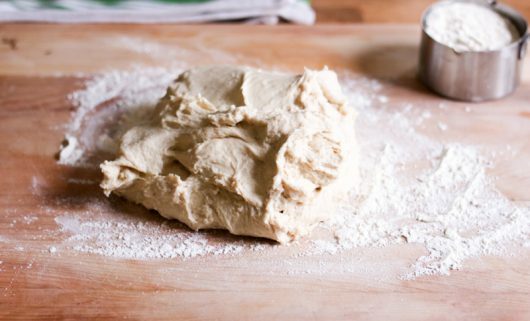 Scrape the dough onto a lightly-floured surface, and knead it by hand for 15 seconds. 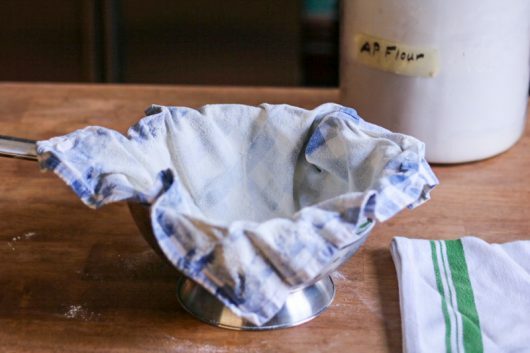 Transfer the dough to a large greased bowl, flip the dough to grease its other side, and then cover the bowl with plastic wrap. Let the dough rise in a warm spot until doubled in volume -- about 90 minutes. 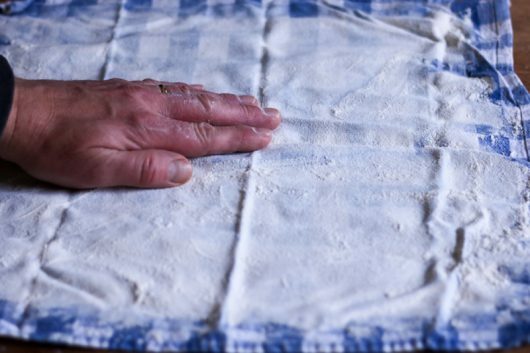 While the dough is rising, pour 3 generous tablespoons of flour onto a tea towel, and rub it in. Line a colander with the towel, floured-side up. 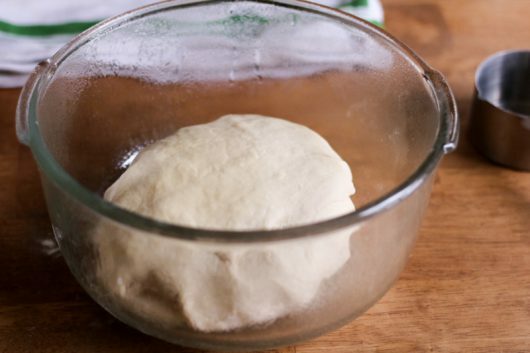 When the dough has doubled in volume, punch it down, pat it out, and form it into a ball. Place the ball seam side down in the lined colander. 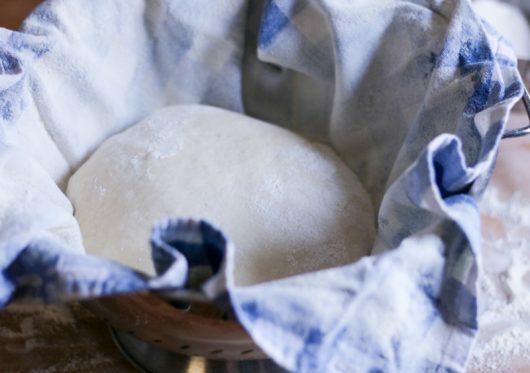 Cover the colander with another tea towel, and let the dough rise until doubled in volume -- about 1 hour. 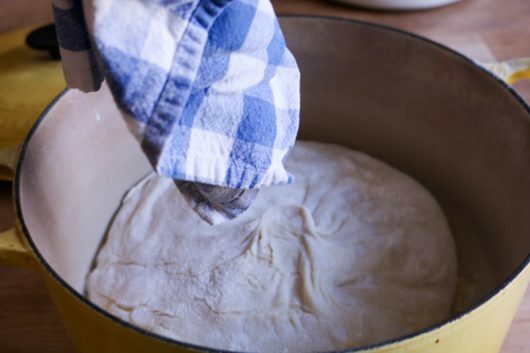 While the dough is rising, place a heavy, oven-proof pot (covered with its lid) on the center rack of the oven. Heat the oven to 450°F. 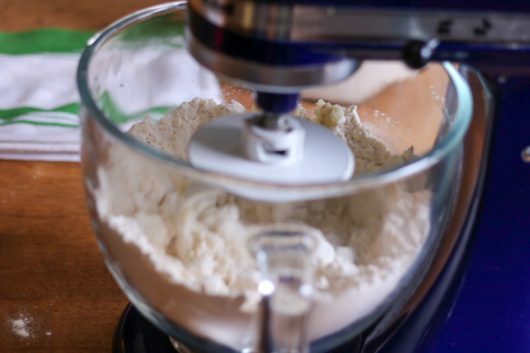 When the dough is ready, sprinkle its top with a tablespoon of flour or cornmeal. Then remove the pot from the oven, and place it on your work surface. Gently pick up the floured towel, and use it to flip the dough into the pot, the seam now facing up. Immediately cover the pot, and return it to the oven. Bake for exactly 30 minutes. Then uncover the pot, lower the oven temperature to 400°F, and bake until the crust turns bronze and splits at the seams — exactly 15 minutes. 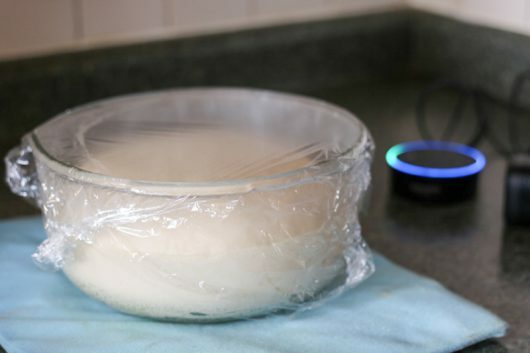 Transfer the bread to a wire rack. Let cool completely before slicing. I love your humour (I am Canadian so our humour has an extra u) and I will definitely try the bread. I don’t think I would make it as I am gluten free, but reading this recipe was the highlight of my morning. However I do find that gf substitutions in recipes often come out well if there is any moist ingredient added. Potatoes might do the trick just like banana, pumpkin, sour cream etc does. 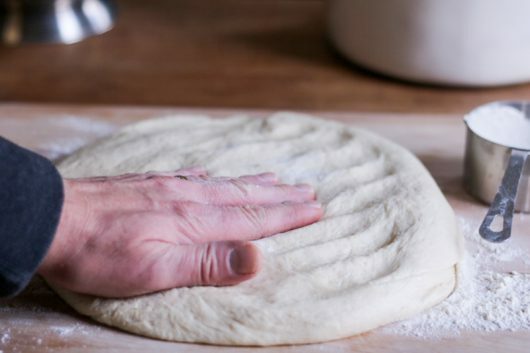 can you use the no knead (Jim Lahey) method on this recipe ? Love he idea of using the floured towel & colander. I’ve made these types of bread before and always have trouble transferring the dough to the pot. Thanks for the recipe! 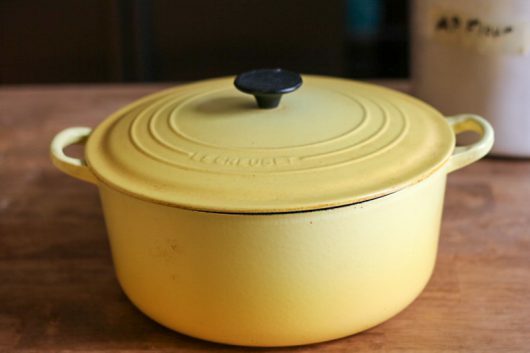 Should the Dutch oven be greased or oiled? Hi Tressa – The Dutch oven is neither greased nor oiled. Flour (or corn meal) on the bread keeps it from sticking to the the pot. This was the first time I have watched the filming of your recipes. I loved the bread and will definitely make it. It looks perfect to share with other docents when I am volunteering as a teacher docent at the history museum here on Bainbridge Island, WA. 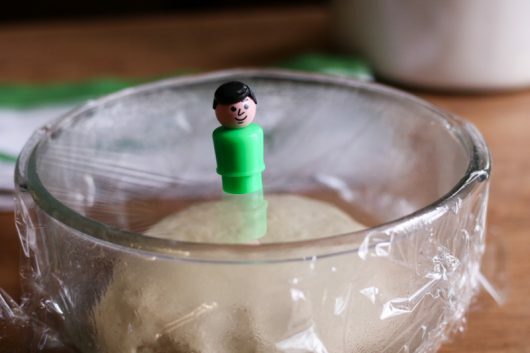 Thanks for both the filming and the printable recipe! I’ve made the standard Jim Lahey breads for quite a long time, but I always have an uneven and shapeless mess after turning the dough into the blisterinly hot pot. 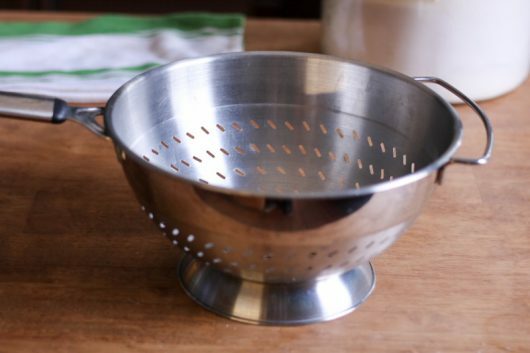 I’m going to give your colander method a go, but will simply hold the towel to the colander handles and invert the whole thing. Great idea! Thanks for the GF laugh. A friend posted a photo on FB of a Tide laundry pod cocktail in a martini glass. Very artfully done and beautiful if one wasn’t expected to drink it. Dear Kevin, I have a somewhat silly question: why boil the potatoes in their jackets, why not peel before boiling? I’m sure you have a reason (because you always do). Your blog has given me so much pleasure; thank you for being you and sharing yourself with the world. I’ve used many of your recipes and all have been wonderful. This looks really good I will definitely make this bread . I’m a bit curious why the colander and towels? I’m going to try this. 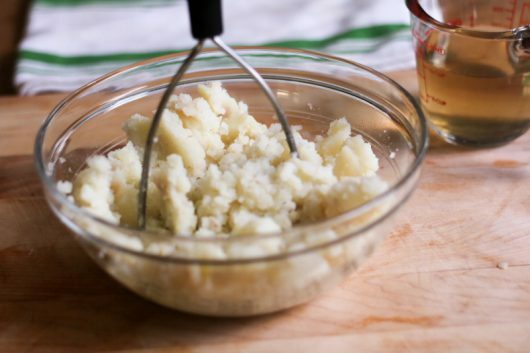 For others who might wonder, a pound of potatoes is 1 3/4 to 2 cups mashed. Just wondering about playing around, but considering whether frozen hash browns would also work? Would be fun to try. This bread looks delicious; but Kevin , it would be so much easier if you could come over to my house to make it. Thank you for all your recipes. I’ll be giving this recipe a whirl – but with Russet potatoes instead. Hope using a white Kitchenaid mixer won’t make too much of a difference in the final product. I make m ost of my own bread, and will definitely try this one. Thank you, Kevin. 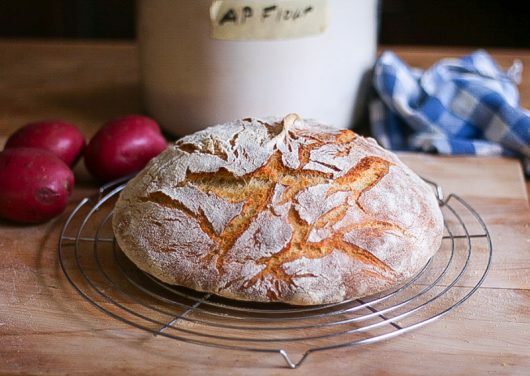 It’s so much fun to make bread (and eat it!) on a grey, chilly day in winter. Really warms the cockles as well as one’s innards and the entire kitchen! I have a slightly easier recipe. 1. Snap up car keys. 2. Fire up vehicle and point toward nearby market. 3. Purchase artisan potato bread. 4. Fire up vehicle and head home. 5. Warm oven and toss in bread for awhile. 6. 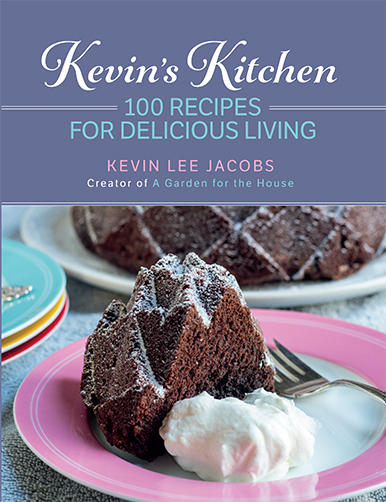 Remove bread, slice, slather with butter, and pretend you made it with Kevin’s recipe. I will definitely try. 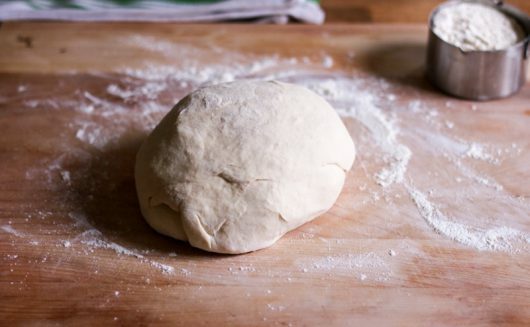 I would do the second rise on parchment paper as “no knead bread” then it easily transfers to the hot pot with the paper. Love your posts! It’s raining. It’s Monday. Looks like the perfect thing to eat today. Would you like to come to the Midwest and bake for me??? My husband is a car fanatic, but also great in the kitchen (the son of a chef). Our white Kitchen Aid mixer has blue flames down the sides. My question is why not peel the potatoes before boiling? Diane, potatoes that are peeled and then boiled absorb quite a bit more water than potatoes that are boiled in their jackets, then cooled and peeled. 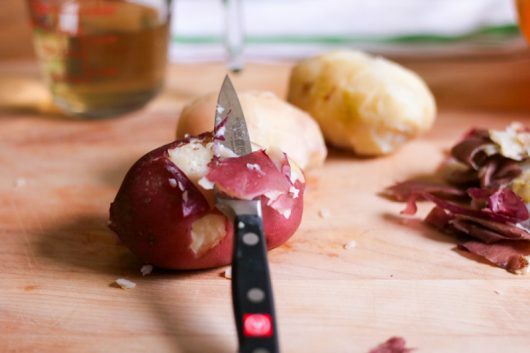 If you’re making potato gnocchi, you prep your potatoes the same way. (Italian nuns taught me this.) Using watery potatoes gives you an inferior end result! made your bread yesterday it was as beautiful as yours ,beautiful brown crust.I didnt care for the inside, kind of flavorless do you think adding more salt would improve the taste? 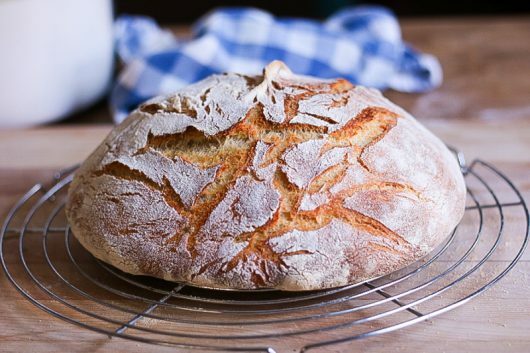 Hi Lynn – The first time I made this bread, I used only 2 teaspoons salt (1/2 teaspoon per cup of flour). The bread was bland. So I added an extra 1/2 teaspoon salt on the next go-round; flavor seemed right. 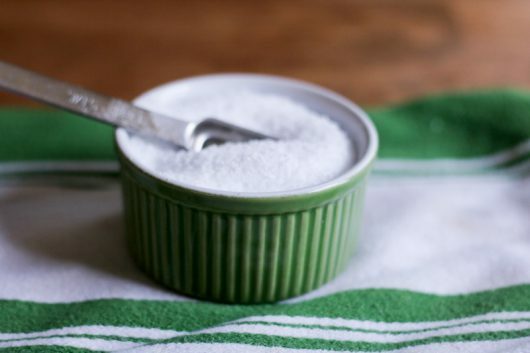 I think you could use up to 3 teaspoons (1 tablespoon) salt for a big flavor-punch. 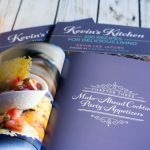 Thank you Kevin ,I will try again .I am thinking of adding a chopped onion,I,ll let you know it turns out .I enjoy your blog alot. I have made several of your recipes and tried your tricks for gardening.We also live in a hundred year old house in northern Mi. I so want to make and eat this bread. Looks so delicious. Wishing I had the mixer and said dutch oven and that my oven temp was working right. Really life is not so bleak. Alas, I guess I’ll have to settle for some Tide pods. This post made my day! I just subscribed and I am glad I did! Patricia, No excuses !! I don’t have a mixer either, tried using my 35 year old cuisinart with the dough blade, that started to overflow, so I just kneaded the dough by hand. 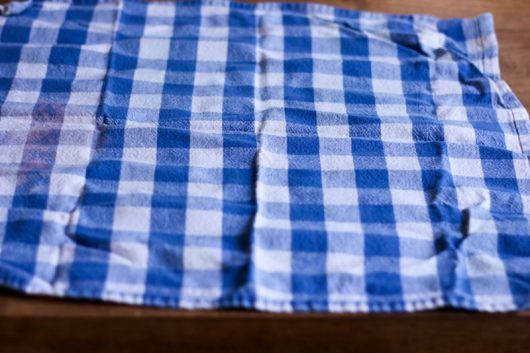 I did not use the tea towel trick either – just “flipped” that risen dough right out of the bowl and into my preheated cast iron Dutch oven. I did use all the exact food ingredients, though. And it turned out wonderful ! I also did not let the loaf cool completely as instructed – I cut myself a slice and am currently dipping it in Italian dipping oil. YUMMY !! You can do it !! Good luck. The potato bread was the best I have ever made. It was a very simple recipe. I did not have the round a round dutch oven ban but did have two 10″ bread pans, so I split the dough and let it do the double rise in them and cooked them for 50 mins at 360 degrees and the bread turned out perfect! I always look forward to your posts! Thanks for sharing! So 1 lb of potato is equivalent to 1 cup? what is the measurement in cups? Hi Ingrid – I googled the answer for you: 1 pound of potatoes equals approximately 2 1/2 cups mashed. Enjoy the bread! Hi! With 4 cups of flour (572gm) and 3/4 cups of liquid (175gm) this bread comes to 32%hydration. I am missong water somewhere?